CONSULTATION & TASTING: Consultation & tastings are scheduled for cakes serving 50 or more. We need at least two weeks notice to set up a tasting and consultation. Flavors provided: Vanilla, Lemon, & Almond. Other flavors provided depending on what is baked that week. We ask that you order your cake at least one or two weeks in advance, especially if there are 3D details that you want on the cake. We want to ensure every cake, big or small, gets our full attention. Wedding cakes should be ordered at least three months in advanced to ensure availability. Please note cake orders are not confirmed without a deposit or full payment. Without a deposit your order is not on our schedule. We have had several people place an order without a deposit and never pick up their orders. Due to increasing costs of supplies and ingredients price quoted is not guaranteed unless a deposit is made. Thank you for understanding. Bailey’s Irish Cream, Butter Pecan, Carrot, Chocolate Mocha, Chocolate Orange, Chocolate Banana, Chocolate Peanut Butter, Chocolate Raspberry, Coconut Cream, German Chocolate, Honey Vanilla, Lemon Lavender, Marble, Pina Colada, Pumpkin, Strawberry, Strawberry Champagne, The VELVETS (Green, Pink, Red, White, Blue) Vanilla Caramel, White Chocolate Vanilla Bean and more! Raspberry Buttercream, Cherry, Chocolate Mocha, Cream Cheese, Ganache, Lemon Curd, Peanut Butter, & Pineapple, and more! Tiered cakes START at $4.00 per serving. Fondant cakes at $5.00 per serving. 3D cakes START at $8.00 per serving (minimum 30 servings). Gluten Free, Vegan and Organic are priced higher. Final price is determined by flavors and complexity of design. Consultations and tastings are done for cakes serving 50 or more. Deposits are non-refundable if you cancel your order. 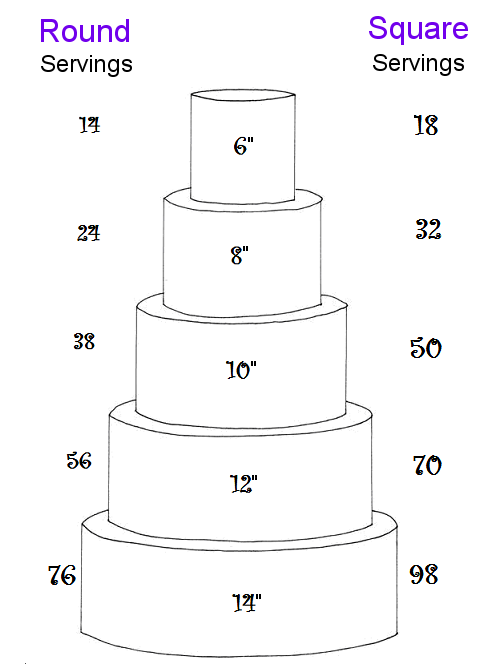 PLEASE NOTE: Standard wedding cake servings are 1″ wide x 2″ deep x 3″-4″ tall. CAKE CUTTING FEE: $150.00. Delivery to Metro Atlanta is $75.00.